"These authors have the right idea! Using the iPad to interact with kids and not as a babysitter. Asking questions and encouraging talk around the programs and what they offer. This is using technology to help kids learn! 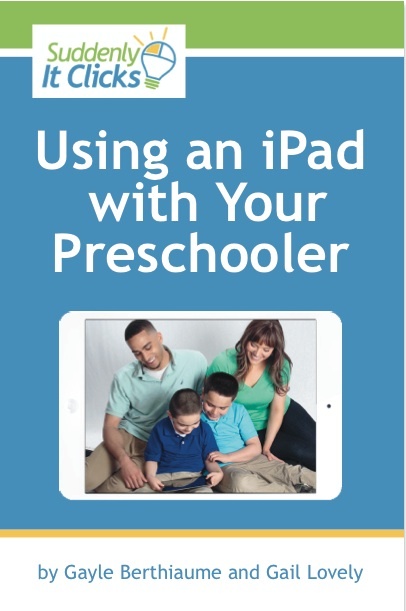 "Using an iPad with your Preschooler" prepares parents with developmentally appropriate ways to nurture and support our youngest digital natives. Clear suggestions are outlined with easy to follow visuals for busy parents to quickly use an iPad to support learning and development. Parents also are equipped with explanations on how to insure device safety and control. Use an iPad with confidence as you interact, learn and laugh with your preschooler." "With chapters covering everything from the basics of playing together, to examples of outdoor activities, to finding apps and choosing the right iPad to begin with, you are sure to find the advice you need to maximize your child’s iPad time and help them grow into a productive 21st century technology user." Because it isn’t by a major publisher, it would be easy to miss this fine “how-to” for beginners, but if you have questions about beneficial, fun, and rewarding ways to use iPads with your young child or grandchild (or any child) or you are overwhelmed by the thousands of choices in the App Store, this book is worth purchasing. As a media literacy text, it only rates 4 stars, but in every other way it is 5 star worthy. The book is visually appealing and well designed, with color-coding that easily guides you to what you need. To folks “in the know” it is clearly grounded in developmentally appropriate practice, with sound advice about the importance of engaging with children and not using the device as a babysitter. For those unfamiliar with educational pedagogy, it tells you what to look for - describing the behaviors that will cue you in to a child’s readiness for certain apps and activities. The authors not only distinguish between ways that youngsters use the iPad – slappers, pointers, tappers, draggers, drawers, writers, and typers – they have developed icons to identify these key developmental stages so readers need do no more than glance at an app description to see if it will match a child’s developmental stage. Most of the recommended apps – and there are dozens of them (divided by type of activity as well as features like “quiet” or noisy) – will be “evergreen.” To avoid the obsolescence-trap of books with tech recommendations, the Gails (or is that Gayles?) have created a website with updates. Many books on using media exhort grown-ups to “talk with your child about what’s on screen.” The problem is, the adults who know how to do that don’t need the advice, and those who don’t know have no clue how to have a conversation with a three-year-old. That’s why my favorite feature of this very accessible volume is the abundance of diverse suggestions for questions you can ask a preschooler to start fruitful conversations. This is where the authors’ decades of professional experience shows up most. I wish they hadn’t included the “What do you like best?” question on p56 – It doesn’t promote much thinking and is hard to follow up. But there are many excellent questions, including some media literacy prompts (though they never use that label). The book’s title makes it clear that this is for iPad users, but the advice about how to interact with a child by using a tablet is also valuable for those using Android devices. I’m impressed by the wide audience addressed by such a short and simple book. It would make an equally excellent gift for a new grandparent who might not be tech savvy, or a teen parent who thinks they are totally tech savvy.